First, because everyone else is doing it…. 2013 was a big crafting/sewing year for me, mostly because I’ve been out of full time work since July while waiting for my Green Card (arrived in October! Woot!). I finally had the time I wanted to put into making things and working on this blog. Thinking about my Top 5 Hits of the year, many of them are more about what stop the project represents along my handmade journey rather than the finished product (though I love the finished products too!) So. 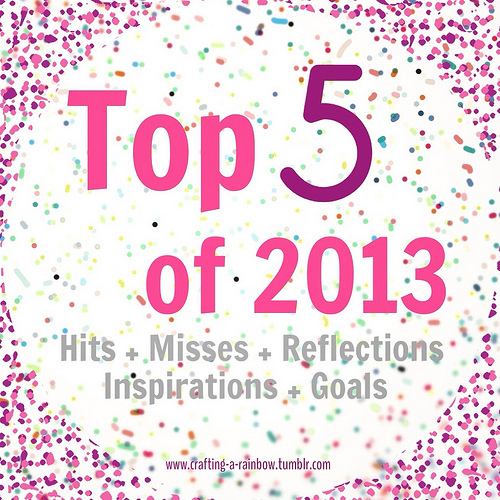 Without further ado, my Top 5 Hits of 2013! 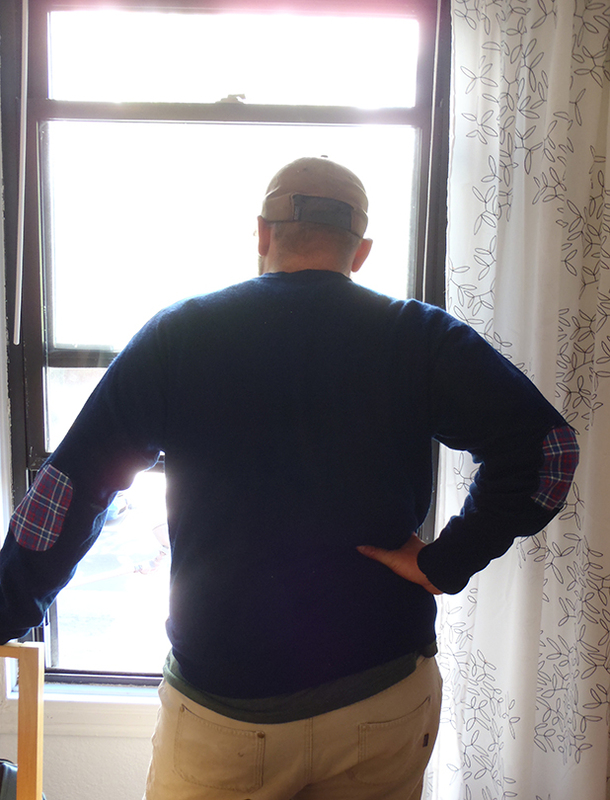 My husband’s favorite sweater finally got a hole in the elbow this year and, inspired by some street fashion he saw in NYC, I made some plaid elbow patches to repair his sweater (tutorial here). This makes the Hit List firstly because he loves the sweater even more now than he did before! But secondly, it represents the emphasis I put on repair and reuse this year. I’m always tempted by wanting shiny new things but I recognize that it’s more important to me to exercise responsible consumption and to save our money for experiences and our future. I get a certain pride from knowing that I’ve extended the life of something, saved it from the landfill and saved some money. I made my version of the Eva dress (free pattern from Your Style Rocks) back in August and I think I’ve worn it twice (which is actually a lot for me to wear a dress in 5 months!). Inspired by many of the blogs I follow, this dress represents one of my first steps toward making things that I actually wear. I thought about my wardrobe, what was missing and what I thought I could use more of (casual but pretty jersey dresses) and decided on this pattern. This thought process will hopefully lead to me actually wearing the clothes I wear rather than leaving them hanging in the closet when I just see a pretty pattern or fabric without really thinking about how it will work with my existing wardrobe or how I’d wear it. riped tanktop had to make it onto my Hit List. The shirt itself has some fit issues – the straps are a bit too wide and it’s pretty baggy – and I encountered some technical issues while sewing (a messed up tension resulted in a really ugly hemline) but I’m proud of it for 3 reasons. 1) I wear it a TON, so it clearly filled a void in my wardrobe, something I want my sewing to focus more on in the New Year. 2) It was a self-drafted pattern and while one of the major lessons it taught me was that I have a lot to learn, it’s fun to know that it’s my tank through and through. 3) This project had some major issues with it and while it definitely sat in the WIP basket for months, I’m really proud that I didn’t give up on it. I thought carefully about possible solutions, decided on (a remarkably easy) one and finished it up! 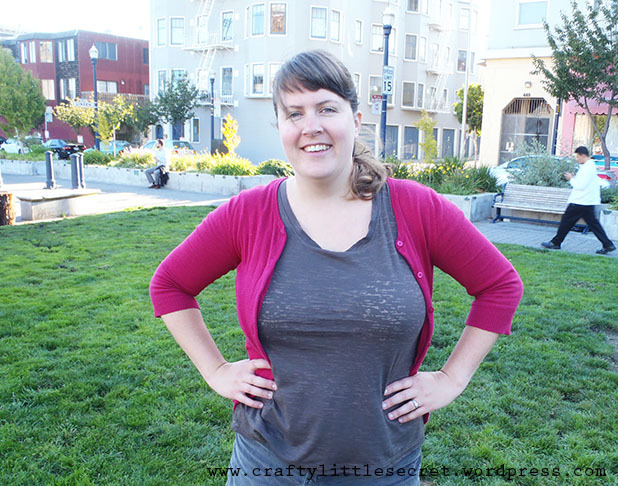 In September I made a simple Scoop Neck Tee and it was a bit of a thought revelation for me. I’ve always thought of sewing as being for making special occasion dresses, costumes and occasional wear. 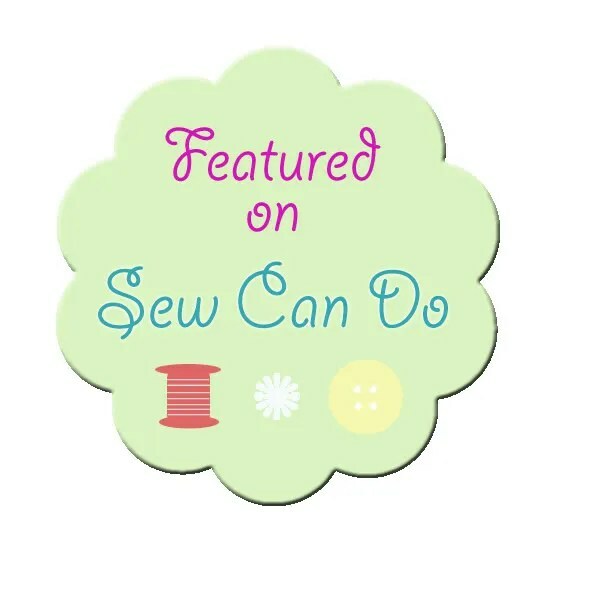 Many of the other sewist bloggers out there really inspired me this year. As Me-Made May passed I really wished that I had more me-made garments incorporated into my wardrobe. This T-shirt represents my decision to sew more wearable garments for myself and to not sew exclusively “fancy” garments. My #1 for this Hit List was an easy choice: my first Mathilde blouse (I say “first” because I’ve already got another in the works and may make even more after that). I’m so proud of this blouse because I chose a pattern that I would be excited to wear, in a cute fabric that worked great with the pattern and I took the time to sew it well. Fully lined with French seams and double turned hems, I just love knowing that I’m wearing a well made shirt when I wear this. Of course, with all this looking back, it’s a great time to look forward and think about what goals I’d like to set for 2014. When I look at the project I chose for my 2013 Hit List, they’re ALL garment sewing projects. Which tells me I should focus on those in the coming year. 1. 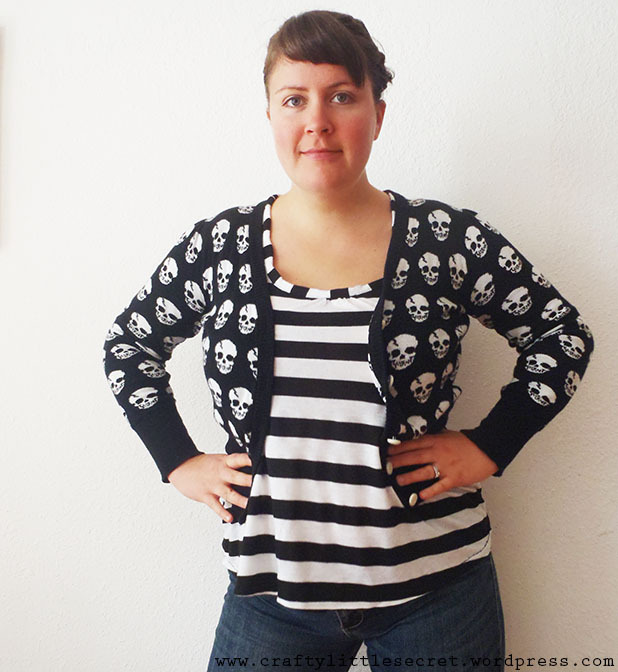 Sew a jacket! I’m thinking Mini-ru like Crab & Bee but I’m open to suggestions! Has anyone sewn a Minoru? Is it an easy pattern for a first time outerwear project? 2. Participate in Me Made May! I just discovered Me Made May this year as I got more into blogging and I found it so inspiring! The idea that I could make myself a wardrobe that I could wear with pride on a daily basis is so exciting! I’d love to work hard over the next few months to make a few more garments (many of which I already have fabric for in my stash) so that I have enough items to participate in Me Made May (to whatever extent I choose). 3. Learn to Draft a Pattern! I bought a pattern drafting book in 2012 and read a couple chapters right away but never started working on any projects. I want to better understand how patterns come together so that I can understand what alterations to make to purchased patterns and how to draft a pattern when I’ve got a clear picture in mind of what I want. What are your 2014 Re-SEW-lutions??? This entry was posted in Uncategorized on January 1, 2014 by missphd. These are great resolutions, and totally doable! 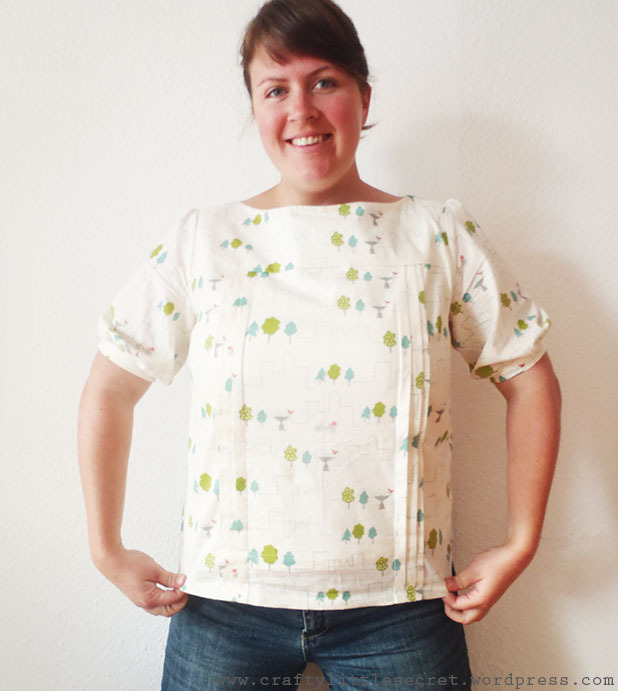 Your Mathilde blouse is adorable!! !